Apple company has added a new feature in their iPhone’s which is the part of the iOS 9 also and is called ” Low Power Mode “. Whenever you use your iPhone and it’s remaining battery only remain 15% to 20% then you’ll always be activate this feature, but if you can also enable it before reaching this limit, and whenever your remaining battery comes to this point, it will automatically enable. In the previous version of iOS 8 the main problem is battery concern which is ended in the new version in iOS 9. 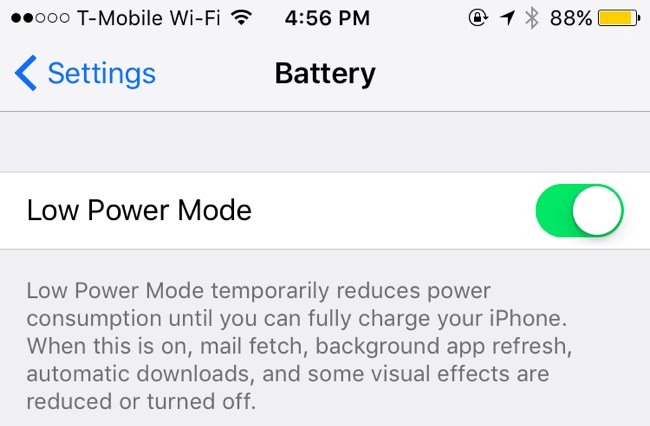 Apple added this feature in iOS 9 and make it more powerful by activating low power mode .Now check out the guide of how it works by just activating low power mode in iPhone . In the all latest smartphones , the main issue is the battery timing . But Apple provide the facility of low power mode which will work for increasing your batter timing. When you use your iPhone and it’s battery drops down up to 20% to 15% , then a message appear and it will ask you to enable low power mode. You can also do this by manual from setting. In iOS 8 users, many time complain and worried to their battery concern, so that’s why Apple provide this function to their users which is called “low power mode”. This function also boost your battery timing for all your iOS devices. Apple’s also claim that after enabling this low power mode feature, your performance reduced. But overall performance remains same, so don’t worry. 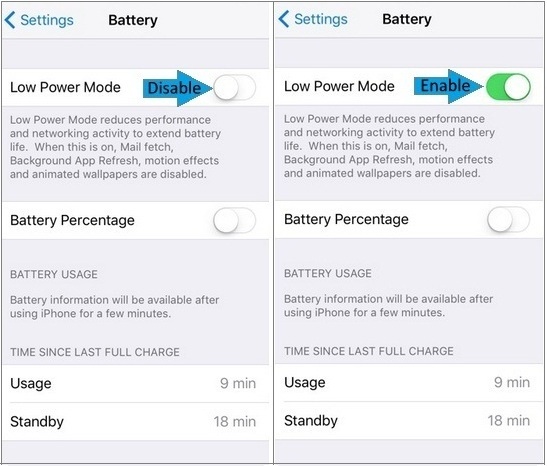 Now below is the complete guide of how to enable or turn on low power mode in iOS 9 on your all iPad, or iPhone. You can simply turn on this function by going into the setting app and change it. But if you don’t know how to do it, then follow below guide and do the same process. Step 1 – First of all go to your Setting . Step 2 – When you go to the setting option, you get a low power mode iPhone option directly. Step 3 – Now simply navigate to Battery. Step 4 – Now turn the option Low Power Mode “ON”. That’s it your work is complete. First you can see the battery color, but when you enable this feature in iPhone, iPad low power mode, then the color of the battery levels are Yellow.Hope you will be fully understand . Now you can also do this process by many other methods, like using Siri option , you can simply do this , see below guide. Siri is the best and very powerful feature in iOS smartphones. Siri is a fastest and quickest way to enable or disable this low power mode option in iPhone. 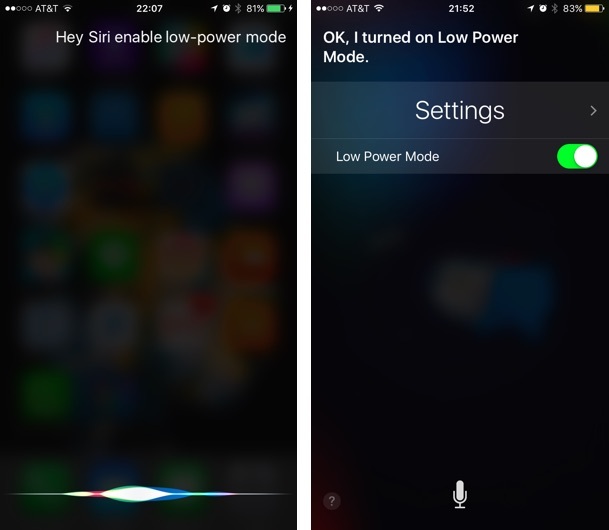 First of all turn on Hey Siri Enabled, and simply launch it and say : “Enable Low Power Mode” and it will automatically enabled this feature. You can also use the Jailbroken iPhone Apps on their iOS 9 device, it will works like a CCSettings that will allow you to add the toggle option for low power mode in the control center, so by do this, you’re able to turn on or turn off lower power mode from anywhere. As I above mentioned that the Apple already claim that after enabling this function , your performance will be reduce, so if you disable this batter timing option , then simple follow this simple guide. Step 1 – First of all go to the Setting , into your iPad, and iPhone. Step 2 – After entering the setting tab, you will get the option directly . Step 3 – Now navigate to battery. Step 4 – Simply turn off the “Low Power Mode” from here. All done ! so in this way you’re able to enable or disable the low power mode feature in iOS devices like iPhone and iPad Mini, iPhone 5, iPhone 6 plus, etc. If you know any other method then simply share below , and if you have any problem face, then let us know in the comment section.